Today’s headline is dual-edged. First, it refers to the camera industry sales: can the industry get by with fewer sales? But it also refers to we users, too, as fewer sales are going to mean that the camera companies are going to have to make some tough choices in which future products to offer. 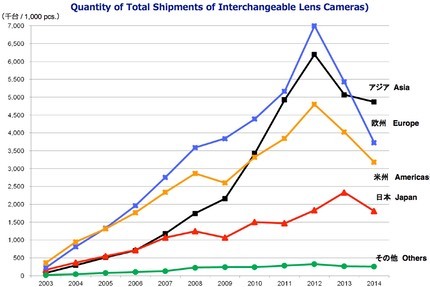 So let’s get right to the highlight: camera makers in Japan forecast selling 34.7m cameras in 2015, of which they project 13m to be interchangeable lens cameras (ILC, which covers both DSLRs and mirrorless). To put that in perspective, the final numbers for 2014 were 43m cameras, of which 13.8m were ILC. Basic math tells us that the Japanese manufacturers are predicting a further volume decline of about 20% overall and about 6% for ILCs. Did I mention that CIPA forecasts have been overly optimistic, especially in the past few years? CIPA’s presentation at CP+ has some further clues as to the characteristics of the problem. You might remember that pretty much every earnings quarter I mention that one or more camera companies state that emerging markets will turn their sales around. How’s that going for them? Seems the emerging markets are pretty much showing the same pattern as the established markets. Moreover, the unit numbers are low to start with. What really struck me were the age statistics (Japan only data, unfortunately). In terms of overall camera sales, a whopping 80% of all digital cameras were bought by someone over 40 years of age. Again, curiously, ILCs were slightly different, with “only” 66% bought by someone over 40 years of age. Again, I’d guess that is mirrorless that is driving that slightly better result. So, the emerging markets won’t save the camera industry, women won’t save the camera industry, and the young won’t save the camera industry. Sensing a pattern here? I am. Meanwhile, the data for the first month of 2015 is now out from CIPA, too. Rather than repeat the usual charts where people get confused by the fact that January comes after Christmas (and thus must explain all the drop in shipments from the previous month), let me graph things a different way, just the January shipments from the last four years. Blue is compact cameras, yellow DSLRs, and the relatively flat green is mirrorless. DSLR sales took a modest drop over the past four Januarys, while compact cameras are in free fall. Mirrorless has been fairly steady, with that slight bump in 2014 actually not indicative of how the entire year went for mirrorless. I don’t expect February or March graphs to be any different at this point. The malaise that the camera industry is experiencing continues unabated. It’s a sign that new products are not resonating with customers. 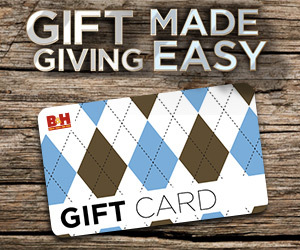 Which brings me back to the headline: can you live on less? Sure, we’ll continue to get camera iterations in megapixels, small performance aspects, and tertiary features, but it’ll probably eventually come in fewer products during the course of a year. 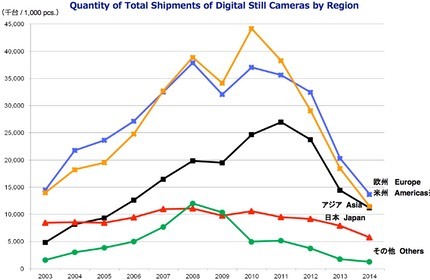 CIPA says 34.7m cameras will be shipped in 2015 by the Japanese makers. Unless something surprising happens, I’m betting that the number will be lower. As usual, I’ll post my prediction for the year after all the financial reports for Q1 appear sometime in April. I wait that long for a reason: generally we can’t see if companies are adjusting slow/fast to trends until the end of their fiscal year (March 31st for all but Canon). The information provided by the companies in their year-end reports tends to be more revealing than those in the interim quarterly reports.